Last week was a very busy week for us here at Redfern Electronics. We attended two different event, one in York, and the other in Glasgow! This meant one thing – road trip! 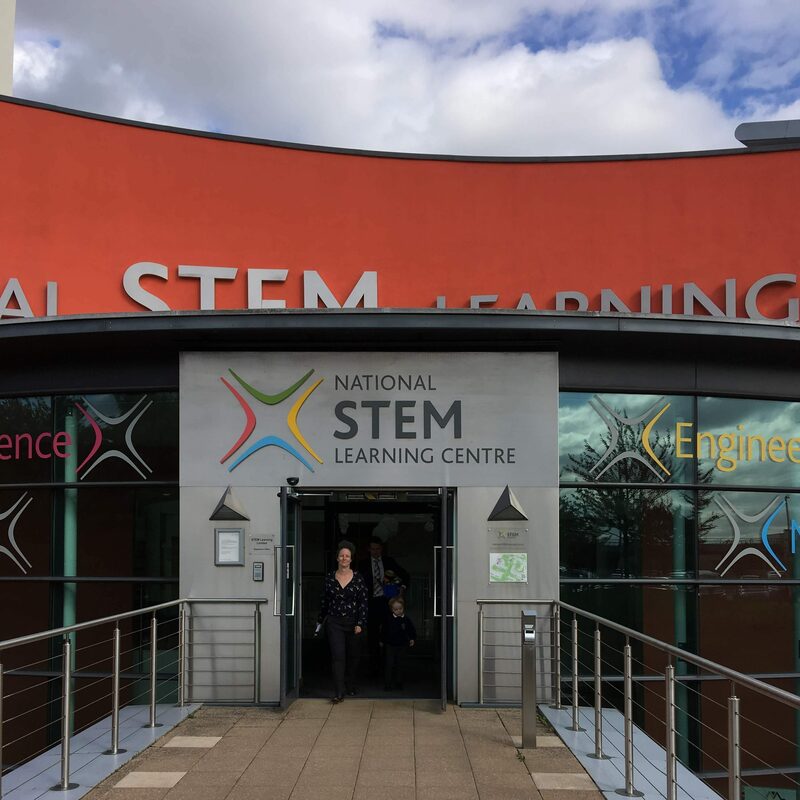 Tuesday saw the official launch event of the ‘Global STEM Award‘, by UK STEM, at the highly-acclaimed National STEM Centre in York. 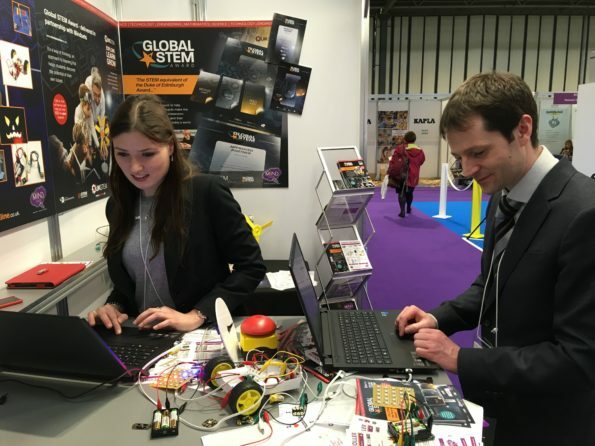 We were there to integrate our products into the Global STEM Award, and all in all, it was a brilliant day. The event was well attended, with over 90 students from local schools, and as far afield as China! The Chinese students were on a trip to the UK, partially organised by Mike Cargill (Director, UK STEM), and it made sense to have more of a global audience for the launch of the Global STEM Award. We were at the Scottish Festival of Learning mainly to exhibit the Crumble. We are finding that whilst the Crumble is well established in England and Wales, it seems that most of Scotland haven’t heard of us! It definitely made sense to exhibit. We had a great couple of days at the exhibition, and we had a great number of interesting conversations, with some fantastic people. 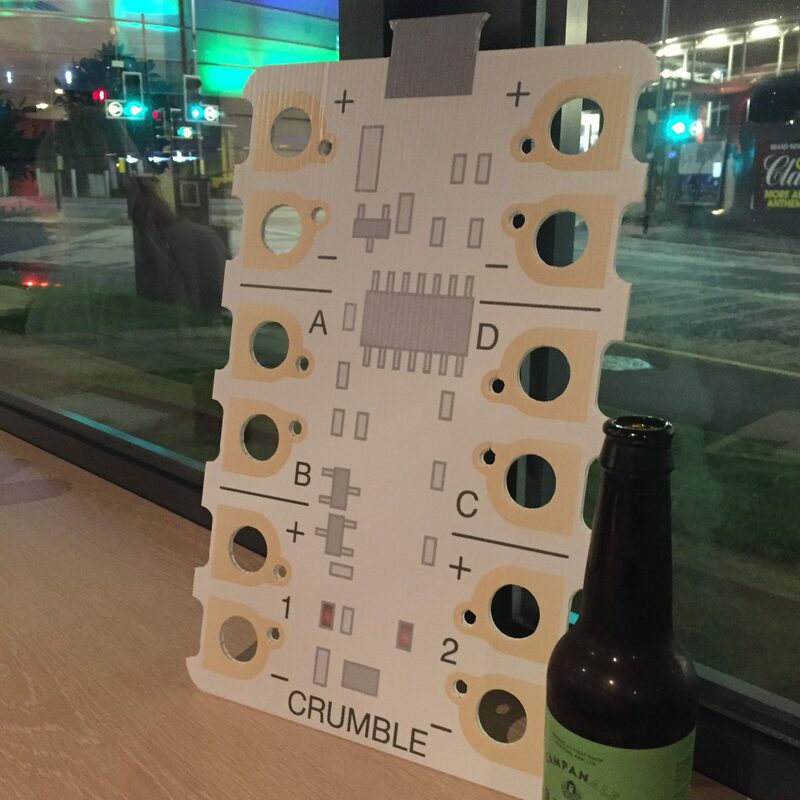 Everyone was pleasantly surprised to find out how easy to use the Crumble is, and how it’s a perfect first step into the world of Physical Computing. Last week, a few of us travelled up to the NEC, Birmingham for the Education Show. 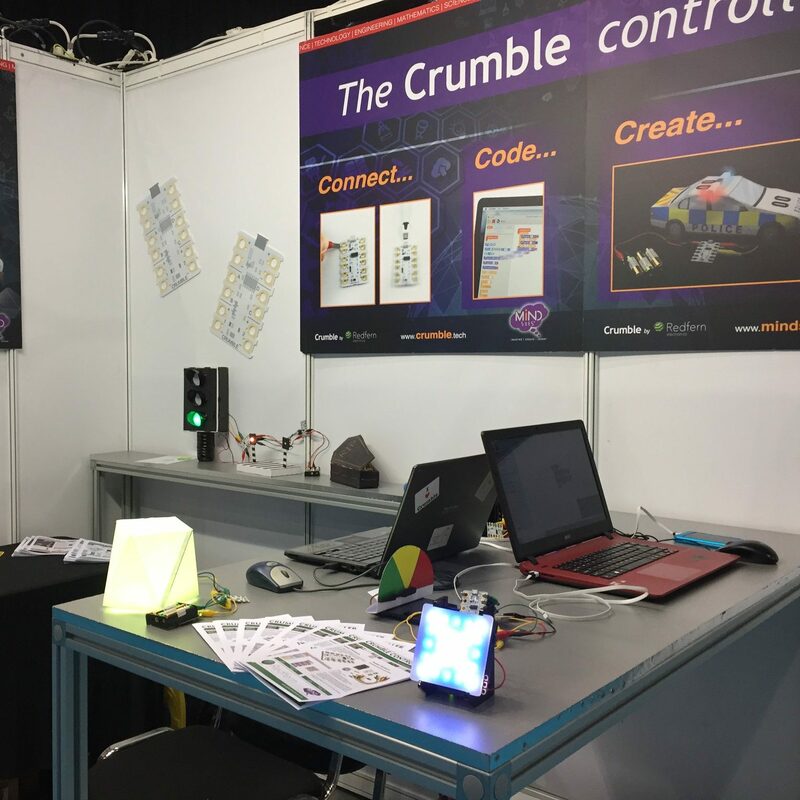 We were there mainly to exhibit the Crumble as the show tends to be geared towards Primary and Home Educators – and the Crumble is perfect for Primary Computing and Design and Technology. Loads of people had a go with the Crumble and there was a real excitement surrounding the stand. 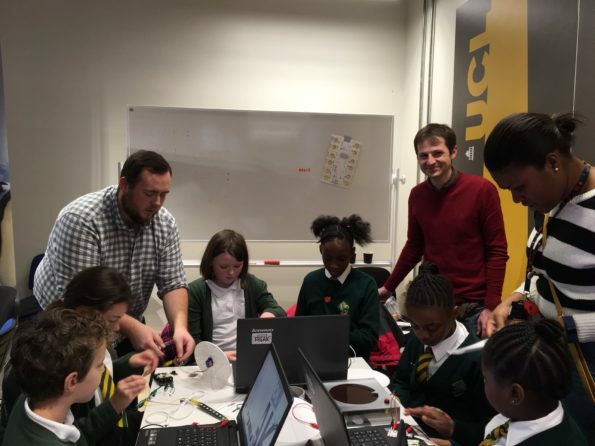 On Friday 6th October 2017, Joseph and Dan from Redfern/Mindsets and Mike Cargill from UKSTEM ventured into London, to help UCL kick start European Code Week. For those of you that don’t know, the European Code Week (EU Code Week) is a grass-roots initiative set up in 2013 by the Young Advisors for Digital Agenda Europe. The Code Week aims to get as many people as possible, from across Europe and the World, to take part in exciting Computer Science activities. It has been growing in success, with nearly 1 million participants from across 50 countries taking part in 2016. The Code Week kickstart event took place at UCL’s BaseKX, Camden – a modern building, designed to provide a space for business start-ups to establish themselves. We were amongst about 15 different companies, including Lego education, Discovery Espresso and Ohbot. The morning started with a few guest speakers, discussing topics ranging from the history of coding, to the development of BaseKX. After a break, the various groups of children found their workshops, and the coding began. We had two different workshops running – one table of 10 children were working on line-drawing buggies, while the other table had a range of activities: our new countdown clock; a probability spinner; a reaction timer; and two matrix Sparkle displays. Each workshop ran for 40 minutes, and there were two more after lunch, so, all together, we got to work with around 60 children from 6 different schools. We love doing events like these, as they allow us to see the impact and enjoyment that the Crumble can have/cause. Without this, it’s really hard to judge what’s happening on the ‘front line’, unless we are given explicit feedback. It also gives us a great opportunity to see if our new ideas and projects are worthwhile, and whether they pass judgement from your average primary school child. At each of our workshop sessions there was a real sense of excitement and a buzz in the atmosphere. The children were always focused on their task and they were all desperate to reach the end-goal of their challenge. When children are new to the Crumble they are great at finding bugs. We were trialling our latest Crumble software update and, sure enough, our first group discovered a bug! This is great because it allows us to fix these issues, before the software becomes public. These events also provide a good platform to test new workshop resources – all of our worksheets were new, along with two new products. As with anything new, there were a couple of teething issues, but this event allowed us to refine our workshop material and make it even better. 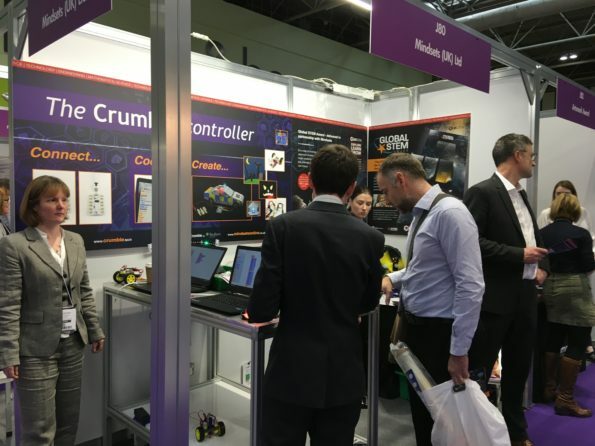 Not only do these events provide us with a platform to let schools know about the Crumble, they provide us with a great opportunity to better ourselves – and for that we are thankful. The icing on the cake was being voted the favourite workshop by two separate schools. That’s not bad considering we only worked with six schools and had some high-quality competition! Read more about Code Week 2017 news and events here. This is a very brief first blog post! I was looking back though some old videos and thought this one would make a good excuse to test out Vimeo. It’s a short clip of my prototype of Mindsets’ Rail Race Timer being tested at an event at the Duxford Imperial War Museum. Unlike most other projects where I’ve used LED displays, these aren’t multiplexed. The circuit used three TLC5927: 16 channel constant current LED drivers. The microcontroller controls the three ICs on a single SPI bus meaning each segment is constantly powered if needed. The lack of flicker means there is no strange effects when taking video. By the way, the Mindsets High Speed Rail Racer is pretty cool. Those cars really move fast!